With the semester well underway, I am spending time on my campus, grading and teaching, which made me think of one of the campus art completed by the Millard Sheets Studio. The Garrison Theater and other spaces around the Claremont Colleges come first to mind, along with “Touchdown Jesus” at Notre Dame and the tapestry in the Foley Communication Arts Center at Loyola Marymount. But Mt. 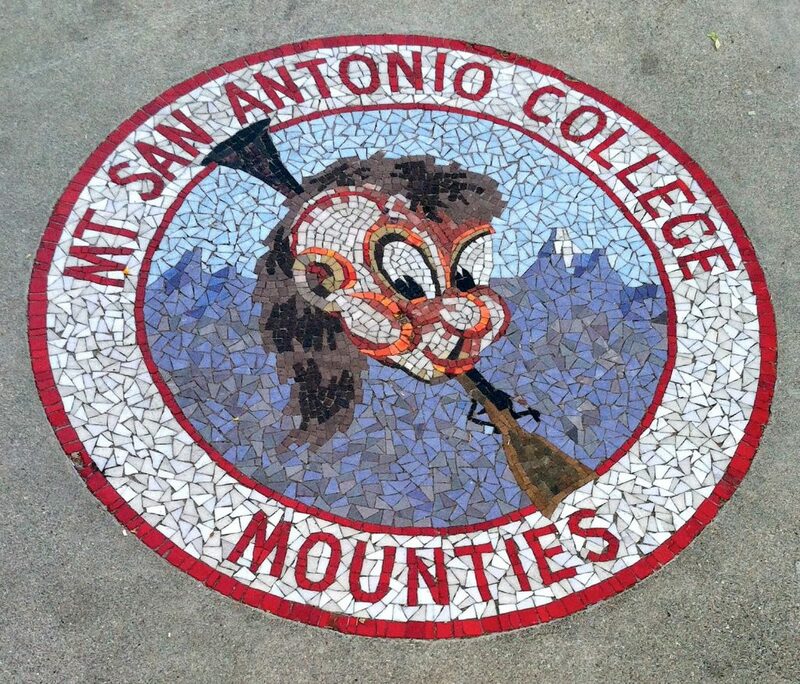 San Antonio College (lovingly called Mt. SAC by those in the know) provides a few intriguing examples — and a question of missing art. But the clear Sheets Studio (and friend-of-Sheets Studio) work for Mt. SAC was (is?) 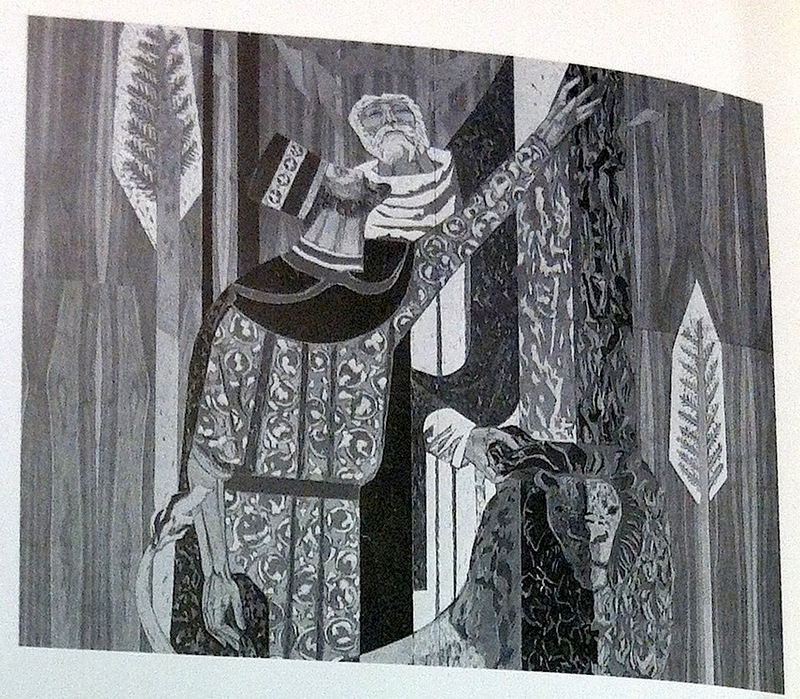 the set of library murals created by Susan Hertel and Tom Van Sant. According to the 1996 Mt. SAC history, Van Sant created murals symbolizing the social sciences and humanities; Hertel’s showed physical and biological sciences, with The Bull, The Flowering Tree, The Horse, and (as seen here) The Water and the Lion. From this photograph — all I have seen of the work — it is clearly linked stylistically to the wood panels and mosaic work of the Sheets Studio for Home Savings, especially (at this moment) reminding me of Pomona and Arcadia. But where are the murals? If on wood panels, they could easily have been removed; canvas murals from the Sheets Studio can also be rolled up. Are they in storage? Covered? Egad, destroyed? I wish we knew more. (I asked around the library in June, but haven’t heard anything.) I hope these murals can be placed back in the public view, ideally at Mt. SAC art gallery or in a public, secure place nearby. 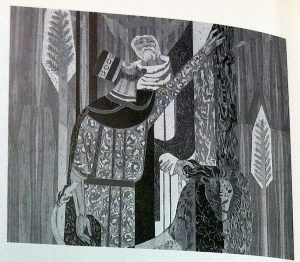 Please be in touch if you know more about these works! The Library murals that you ask about were entombed during the Library renovation (after 1997); that is, new walls were erected over the existing walls. The faculty—to my knowledge—did not know about this, nor were we notified. At the time, I was a relatively new faculty member of the Art Department (now in the History Department). I contacted the Board of Trustees at the time of the renovation, protesting the entombment of the Hertel murals and the covering of the geometric design on the exterior of the building. I was patiently “heard,” but the reconstruction (destruction?) team continued with its work. It is an absolute travesty, reflecting the Mt. SAC District’s complete and utter failure to promote the visual arts on campus and recognize the historical importance of Sue Hertel and other local artists. Thanks for this information, and sorry to hear it. Do you think any recovery would be possible, if the will and funds were to materialize? Or did the process destroy them? So sorry to see your response now, so many months and years later. My understanding is that the murals are “entombed.” I’m sure that if there were interest in uncovering them that funds could be directed to their restoration—and I’ve heard talk that the building will be up for more renovation—but whether there is the “will” or not, I don’t know. There used to be a stairwell joining the two levels. It has been closed to “public” traffic for a long time, but I’m fairly certain that it is used by staff. There was a mural or mosaic there, as well. It has been a long time since I’ve seen it—nearly 20 years. Coincidently, our aunt, Katheryn Vlietstra, was the secretary of Millard Sheets and his partner, David Underwood.